Exterior drainage services provided by Rapid Foundation Repair specialize in exterior drainage and exterior waterproofing. We all assume that when our home was constructed, the contractor installed a perimeter drain system and that they waterproofed the walls. Often home builders only damp-proof the walls with a spray-on material that looks like waterproofing emulsion. Instead, it’s watered down and doesn’t completely waterproof the basement. Water can enter your basement interior in a number of ways. Our first concern is water flow. If the path of least resistance flows into your basement, then that’s where the water will go. Capillary action is like a wick. Concrete is a porous material and as it sits in the water, it absorbs into the concrete until it becomes completely saturated. The damp concrete then disperses moisture and water vapor to the inside of the home. Vapor diffusion is similar to capillary action, except we’re dealing with water vapor. Water vapor only needs the smallest of opening to penetrate the structure and actually raise the humidity levels. This is called the stack effect. Your home draws air in from the bottom toward the top and 40% of the air we breathe in our homes comes up from the basement. Exterior drainage provided by Rapid Foundation Repair services South Dakota, Wyoming, and parts of Nebraska and can provide solutions to the problems above, and protect your home going forward. Here at Rapid Foundation Repair, we offer professional exterior drainage solutions to ensure you have a dry home. 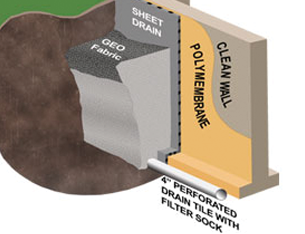 Our top quality Earth Contact Products provide a durable solution for your wet basement needs. First, we clean your foundation walls and apply a polymer waterproofing product. Then this coating is covered with a dimple board that protects the sealed surface and allows better downward water flow. We then install a drain pipe system for continuous drainage. We also offer interior waterproofing for a full waterproofing solution for your home. Let the experts at Rapid Foundation Repair in South Dakota assist you with your exterior drainage needs. Our exterior drainage services prevent wet basements and protect your home from water damage. Get a free quote from the local experts: Call us today!